So many of the things we use everyday have been influenced by the Romans – our calendar, domed buildings, highways, milestones, bridges, aqueducts, concrete, bronze valves, water pumps and more. The Romans were excellent engineers, developing a large number of instruments and tools for engineering, construction and measurement. But, when it comes to heating technology, we, in our industry, are most influenced by the architecture of the Roman baths – more specifically, their heating system. After TJ’s visit to Frankfurt, Germany for the 2011 ISH trade fair, our company decided to take a side trip to Rome to see, first hand, remnants of an ancient radiant heating system. 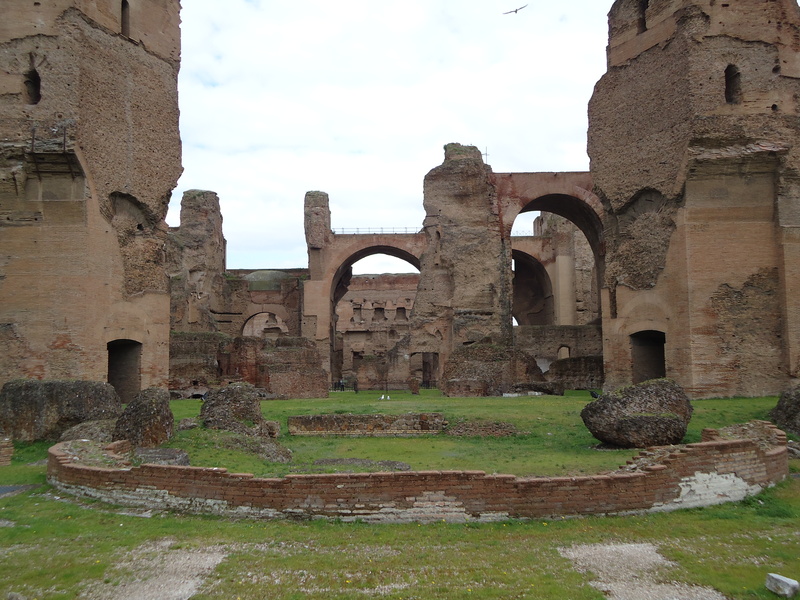 During our visit to the Baths of Caracalla, we were amazed by the massive size of the Baths. Unfortunately, we were disappointed to find that the heating system was still underground and had not yet been excavated. We did, however, find remains of a heating system at the House of the Vestal Virgins in Rome. Baths of Caracalla – View of the location of the Calderium with the Trepidarium and Frigidarium beyond. 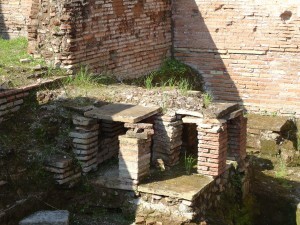 The ancient Hypocaust system (heating system) and the lead pipes of the water system, remain unexcavated below. The heating system for the Roman baths was a Hypocaust system, which is a form of central heating. Hypocaust literally means “heat from below”. The wood furnace was fueled continually to keep the heat constant. The perfect draft conditions were created via strategically placed chimneys. Columns were built in the floor the same distance apart to allow the heat generated by the fire to move from along the floor evenly, and to allow enough room for a slave to fit in between for cleaning. Additionally, box-shaped hollow columns were built into the walls to allow the heat to rise. Then, column holes at the top of the walls allowed the heat to travel across. Finally, there were vents in the ceiling to allow the heat to escape.The wood furnace heated three walls of the calderium, which included a hot pool, and one wall of the trepidarium, which included a warm pool. The water became less cold as it travelled away from the calderium, to the trepidarium and finally, to the frigidarium. Remains of floor columns that allowed heat to travel along the floor, and eventually up the walls, at the House of the Vestal Virgins in Rome. Further evidence of ancient Roman engineering genius was the domed ceilings, that were built with few windows to minimize condensation, natural solar heating and the use of aquaducts to fill and drain the pools. The domed ceiling allowed the condensation to dribble along the side and back into the pool located in the frigidarium. The windows of the hottest room, the calderium, faced toward the sun, to allow for natural solar heating. The water for the pools in the Roman Baths was brought in via the aquaduct system. In fact, the Romans also had a system to drain the pools, so that the water was refreshed when necessary. Although we do not use aquaducts today for our water source and our radiant heat technology has developed into a modern system, we use many of the same principles in our designs to attain comfortable, efficient heating. Our course, we also enjoy some differences. Today, we use water in our radiant systems, where the Romans used heat generated from their wood furnaces. Also, our radiant floors have a lower temperature which creates the ultimate comfort. We enjoy “toasty” feet and can enjoy the feel of the warm floors barefoot. The Romans would have had to wear sandals to walk on the hottest floors because they had no way to regulate the temperature of the floor in the calderium. TJ’s uses weather responsive controls for our radiant system designs to allow complete control over the water temperature entering the floors, so there is no need to wear sandals. The floor temperatures are actually always lower than your body temperature – the perfect temperature for the ultimate comfort! Office Manager for TJ’s Plumbing and Heating, Inc.